Two members of the NIU community were recognized for their achievements at the annual convention of the Illinois Communication and Theatre Association, held in late September in Bloomington. 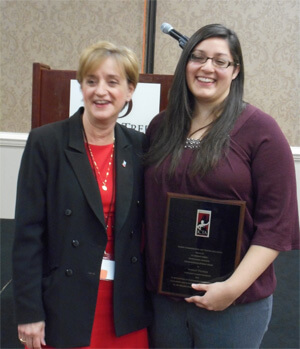 Judy Santacaterina, an NIU Forensics coach and longtime champion of the program, presented NIU student Yanelly Villegas with the 2015 Norton Graduate Student Award. The award recognizes a graduate student who has made outstanding contributions to the fields of communication and/or theater. Villegas earned both her bachelor’s and master’s degrees from NIU. Her contributions include her outstanding work as an assistant debate coach with NIU Forensics, her collaboration with NIU’s College of Business to bring argumentation skills to graduate students in accountancy, and her work with the Argument Centered Education (ACE) program, which provides debate experiences to Chicago’s underserved high school students. Villegas is presently an instructor in the Department of Communication. Santacaterina herself was awarded the W. P. Sandford Award, the longest-standing award presented by ICTA. It recognizes exceptional service to the association over an extended period and significant contributions to the field of speech and theater. The award was presented to Santacaterina by her former student, Professor Jeff Przybylo from Harper College. Santacaterina has served as the director of Individual Events at NIU since 1982, gaining national recognition for her contributions as a coach, teacher and mentor. She has coached numerous state and national champion speakers, including 15 interstate orators. She also served as secretary of ICTA in 1984 and president in 2013. NIU has rich tradition with the Illinois Communication and Theatre Association and with the Sanford Award. Five of the previous award winners were NIU Department of Communication faculty members, including Santacaterina’s mentor, Phil Gray, who was presented the award by Santacaterina in 1995.